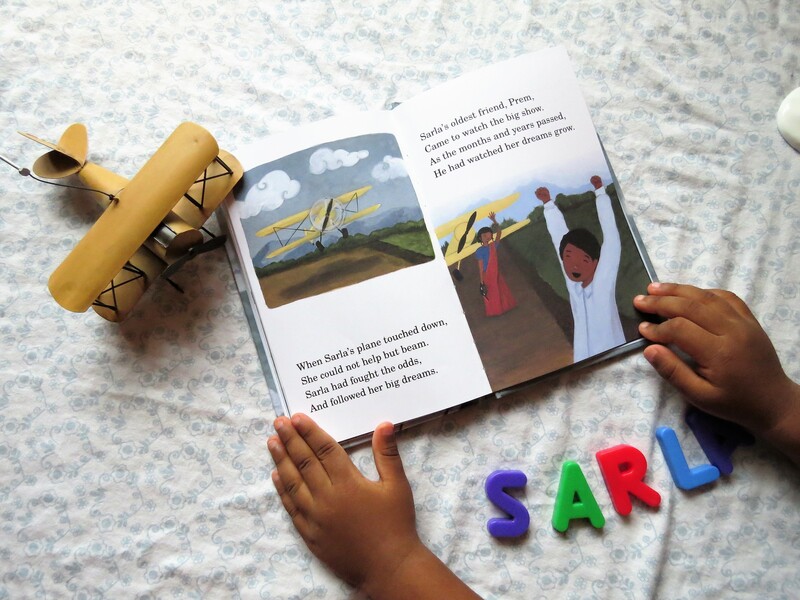 When Sailaja Joshi of Bharat Babies contacted me to write a review for the first Bharat Babies’ early reader Sarla in the Sky, I obviously couldn’t refuse! I knew right away my independent and strong-willed Akshaya would love reading about an empowering young woman such as Sarla. As a mother of a little girl, I often find myself on the hunt for stories centred around strong female characters. I cannot emphasize enough how important it is for young girls like my daughter to have relatable female role models and Sarla in the Sky, offers just that. This hardcover book, perfect for elementary school age children tells the tale of Sarla Thakral, who in 1936 became the first Indian woman to obtain her aviation pilot’s license at the age of 21. This is especially inspiring because of the time period. Sarla had to face many challenges to pursue her dreams and prove to the world that a woman can indeed fly and fly well at that. This tale is not only great for young girls but young boys as well as it conveys the universal message that no matter what obstacles stand in your way, you should never give up on your dreams and that with hard work and perseverance one day those dreams will indeed become a reality. Akshaya enjoyed reading out loud the poetic text while her brothers and I listened intently. The kids were really captivated by the beautiful illustrations by Lisa Kurt which accompanied the text, often pointing at details the other missed. My daughter’s favourite page was that of Sarla in a saree beside her plane. She was so impressed that Sarla flew a plane wearing a saree while her own mother has trouble just walking in one. 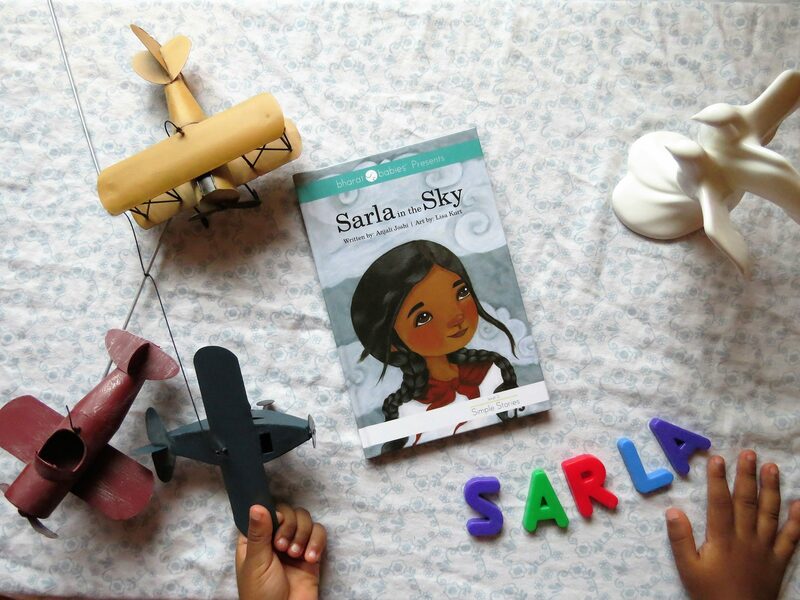 I can easily see Sarla in the Sky becoming Akshaya’s new favourite as we have been reading it almost every night since receiving it in the mail this Monday. If you don’t have a copy of Sarla in the Sky, you can order a copy here. This book would make a delightful gift for the little ones and STEM (science, technology, engineering, and math) enthusiasts in your life. 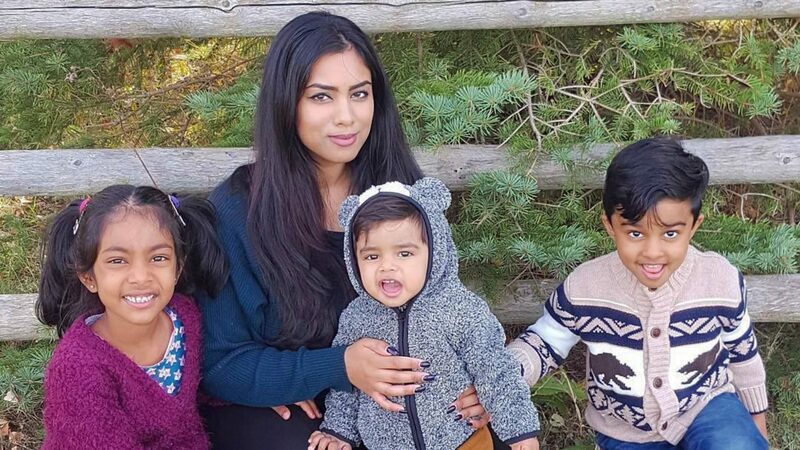 NOTE: Bharat Babies is kindly offering my readers 20% off on ANY purchase from bharatbabies.com from now until October 8th! Simply use coupon code MBM20 when checking out. Click here to read my review on Bharat Babies.